TarteTatin.org was created to share the secrets of the famous tarte, which has become one of the world's most celebrated desserts. It was born around 1880 in the small town of Lamotte-Beuvron in Central France, about 100 miles South of Paris, an area thick with wetlands and waterfowl, long popular with hunters. 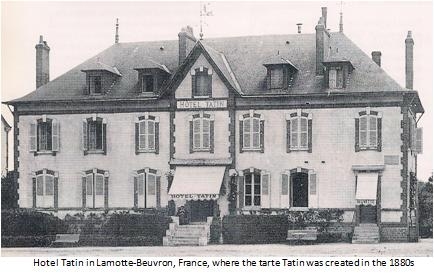 The story has it that, Stéphanie Tatin, who ran the family hostel with her sister Caroline, once accidentally dropped an apple tarte while rushing about the kitchen. With hungry patrons calling, she promptly picked it up and rearranged it as best as she could, which happened to be upside down, and stuck it in the oven. Once baked, she flipped it back up on a dish, and discovered to her surprise the rich caramelized texture that is the tarte's hallmark. Over the years, the recipe has evolved, improved by the contributions of successive cooks and better cookware. We invite you to retrace its history, and discover the tips that will make you a foolproof cordon bleu. Better yet, come enjoy it in its birthplace, and treat yourself to the wonderful scenery that illustrates this website. Where in the world is Lamotte-Beuvron?